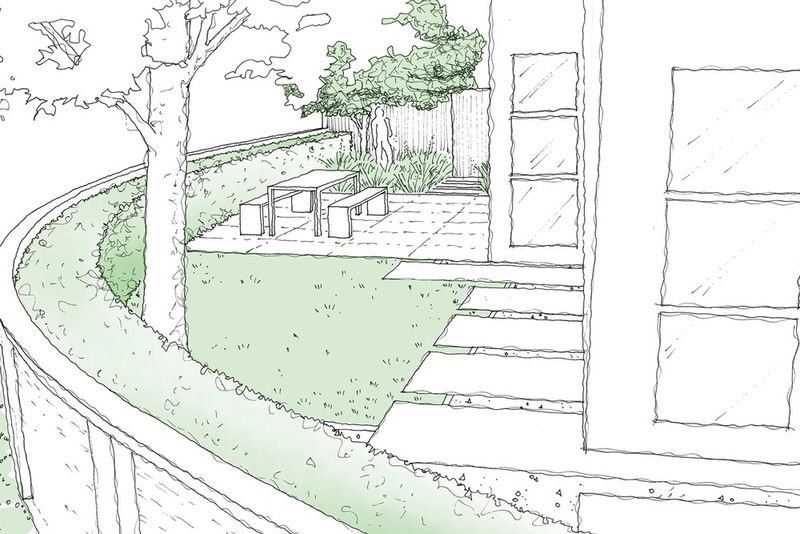 From modest gardens to award winning coastal and country gardens our residential work responds to the individual design needs of each unique client. From design to construction we have an established network of trusted Wellington contractors that cater to any scale. 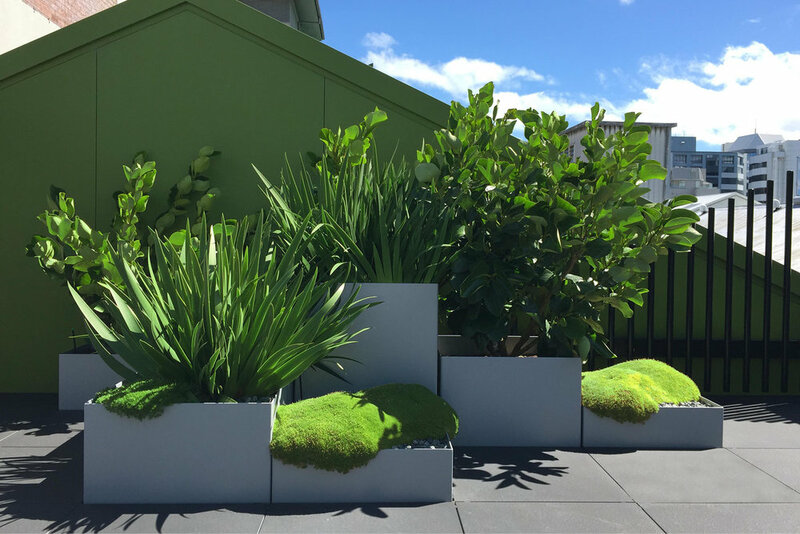 This garden won the Small Projects category of the New Zealand Insitute of Landscape Architects 2017 Pride of Place Awards and was featured in the July 2016 issue of NZ House and Garden Magazine. 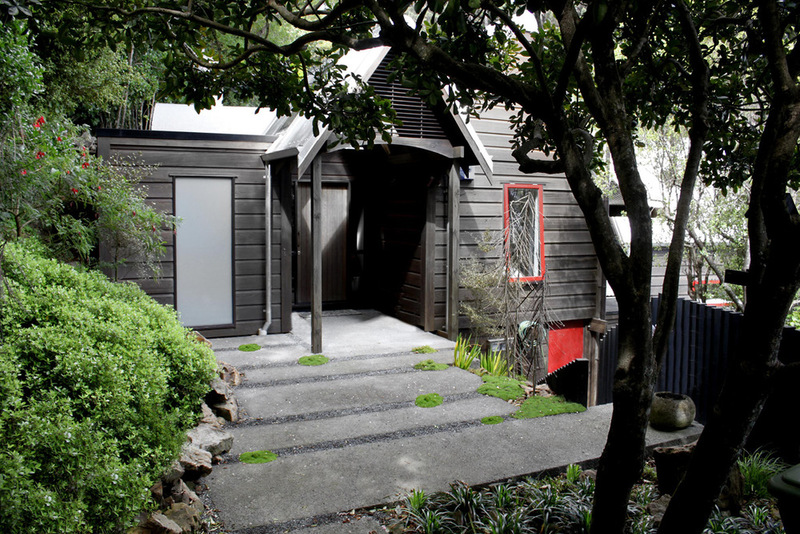 Located just off Wellington’s vibrant Cuba Street, the garden wraps around a new house by architect David Melling on a tight urban site. Staggered strips of concrete and bluestone provide a sculptural structure to the spaces while the informal native planting de-emphasises the the boundaries to create a soft, restful respite from the pace of the city. 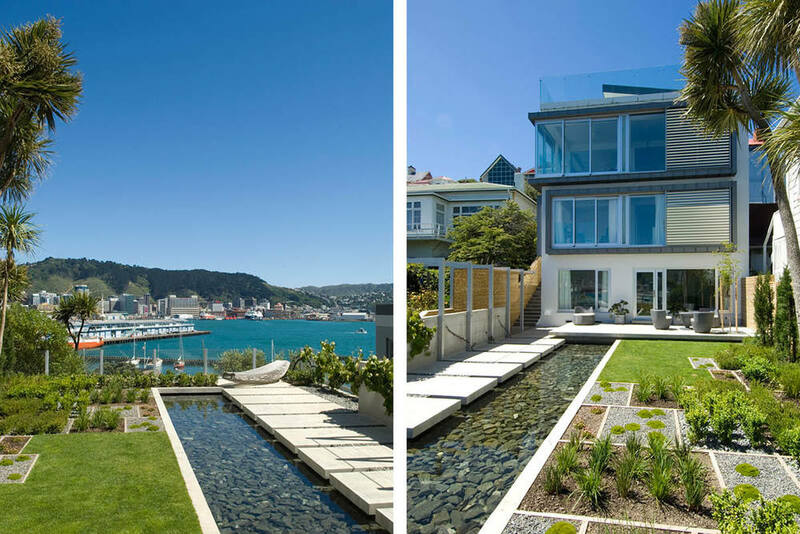 Varying lengths of bluestone are used to create a three dimensional fountain, over which water cascades providing a gentle aural counterpoint to the background hum of urban Wellington and play element for the client's grandchildren. 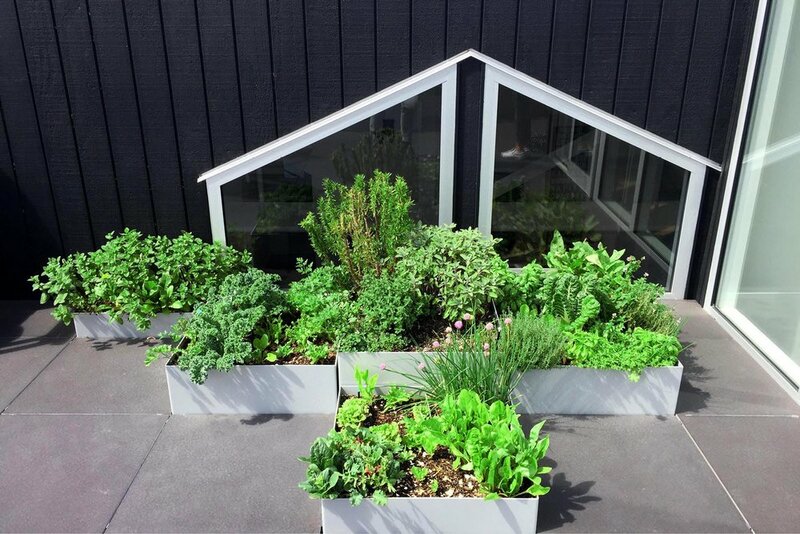 This small but precisely detailed roof-garden was completed in 2013 and has since flourished under the care of its owners. 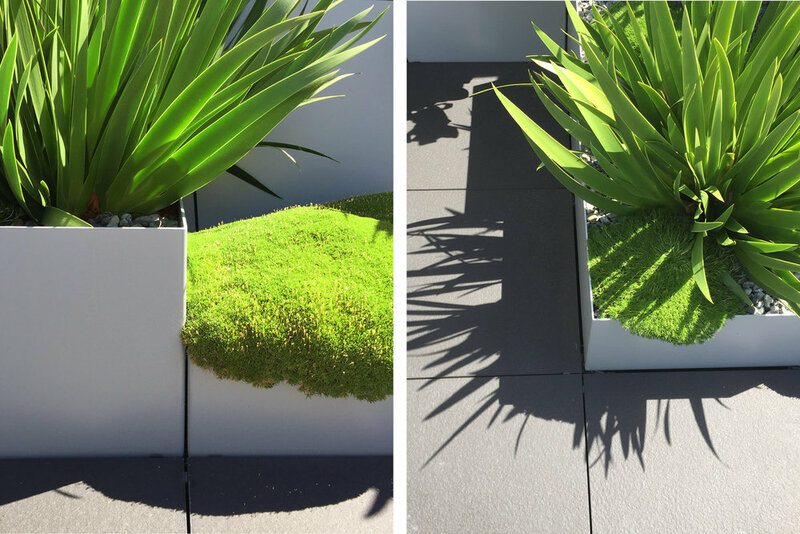 Aluminium planters were made to fit the tile format which sit on pedestals to protect the waterproofing membrane beneath and provide space for hardy decorative and herb planting. 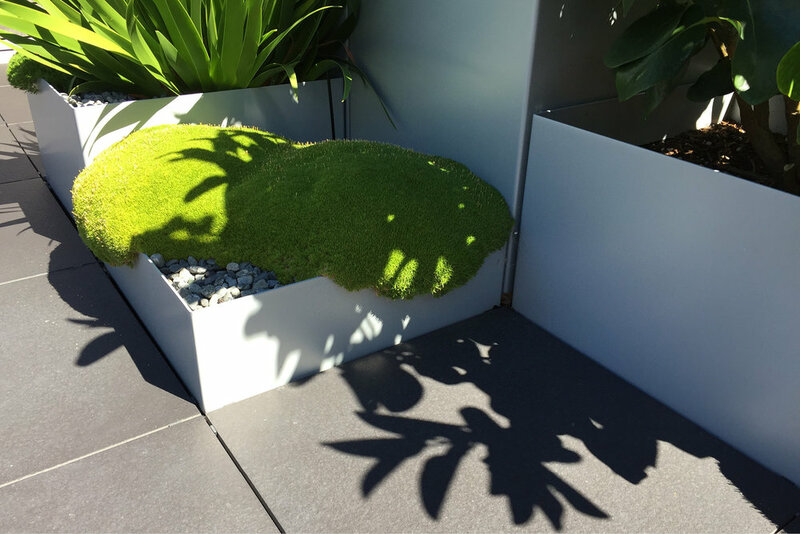 The lush green native plants compliment the bright green wall behind to simplify and calm the small space while providing a colourful contrast to the silvered hardwood wind screen, seat and table setting. The black vertical steel balustrade echoes the shape of the original warehouse wall and provides a safe but transparent barrier to make the most of the urban views beyond. 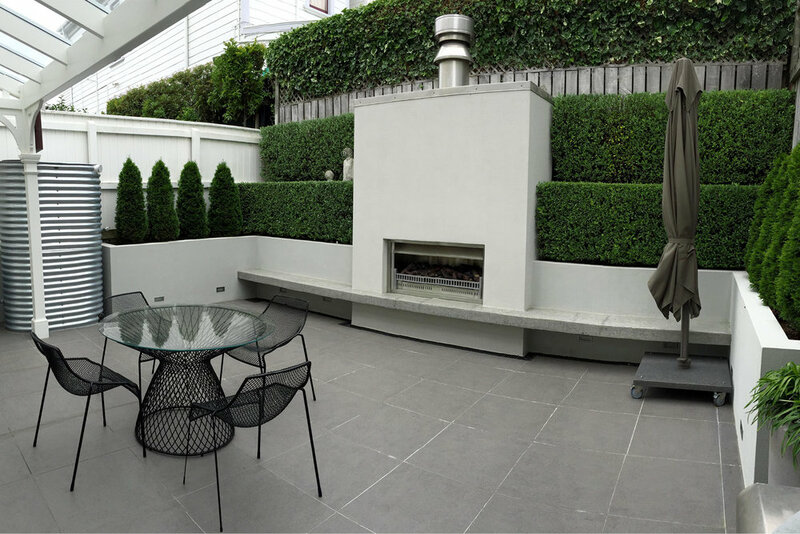 This inner city courtyard was developed in conjunction with a major renovation of the heritage building by Wellington architect Philip Porritt. Useable space in a tight site and a restful vista from the house were key requirements for the clients so simplicity was key. The existing raised lawn was to be removed to make more space at the ground floor level and retaining provided along the boundaries to achieve this. Vertical planting like corokia and thuja were used in layers to provide maximum greening, softening but most importantly depth. 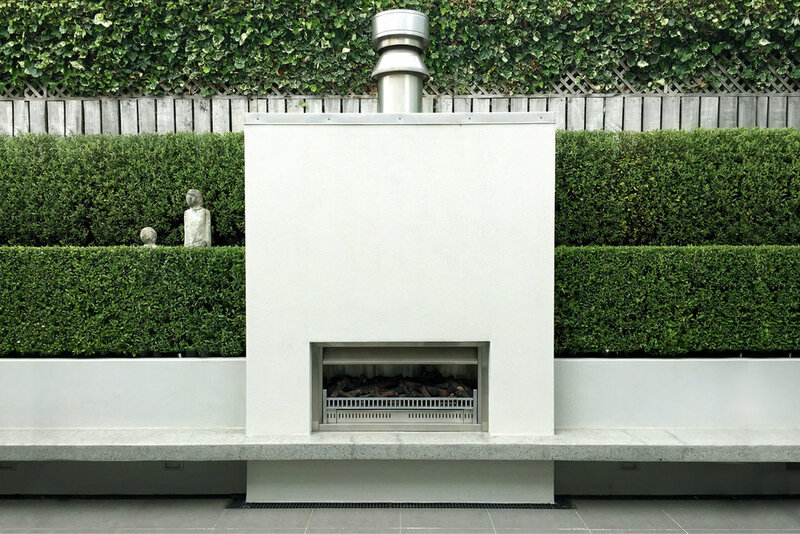 The fire was intended to provide a focal feature from both inside and outside the house. A glazed pergola was constructed along the façade facing the rear courtyard to provide a generous area which allows barbeque access in all weather. A slim zinc-allume emergency water tank which is fed by stormwater collected on the pergola roof is located on the northern boundary. The front terrace is built over the garage and therefore had no soil to plant in. Bespoke timber planters were made to house thuja and westringia balls around the edges with further softening provided by tall concrete planters and smaller square pots at the front door. 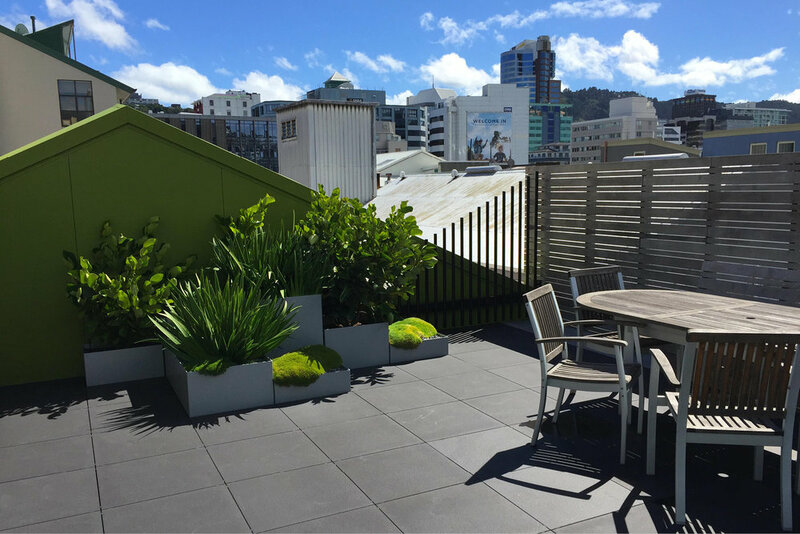 This project provides a creative solution to a perennial Wellington problem of providing safe, low cost access on a very steeply sloping site. 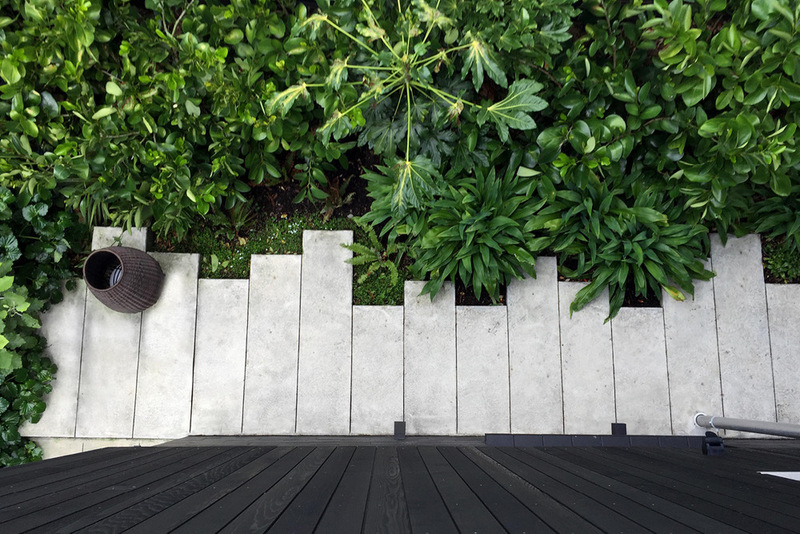 The scheme uses simple black stained timber retaining but plays with slatted overlay to create visual interest and provide safety barriers for anyone maintaining the planting above. LED lighting behind the slats provides a dramatic light play at night while providing soft, low-glare lighting to get you to the front door safely. A simple, easy care planting scheme was designed to minimise maintenance and survive on the tricky sloping site. 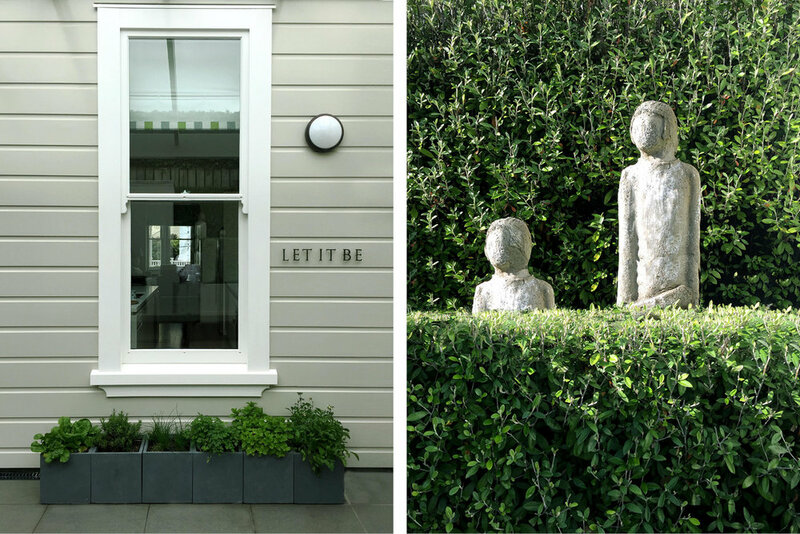 This garden was featured in HOME NZ magazine, the Penguin book on Contemporary Gardens of New Zealand and won an award for outstanding design with the New Zealand Institute of Landscape Architects. 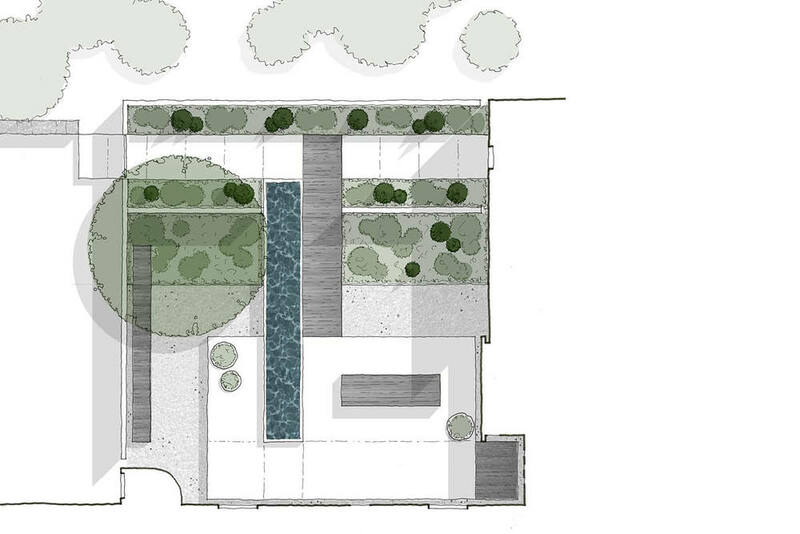 Set one property back from the beach, the garden has been divided into a series of small courtyards, designed to allow differing activities and positions for sculpture. 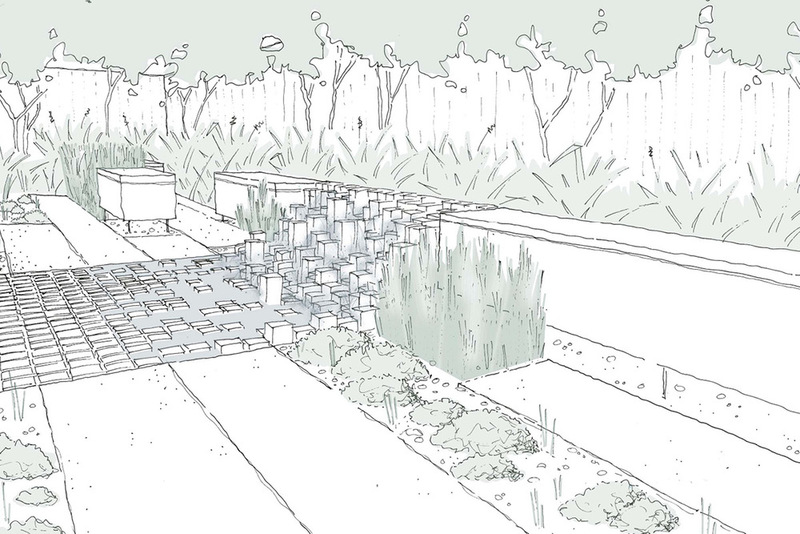 The courtyards are separated by free standing walls and lines of corokia hedging which will provide shelter for more delicate planting between from the harsh coastal conditions. 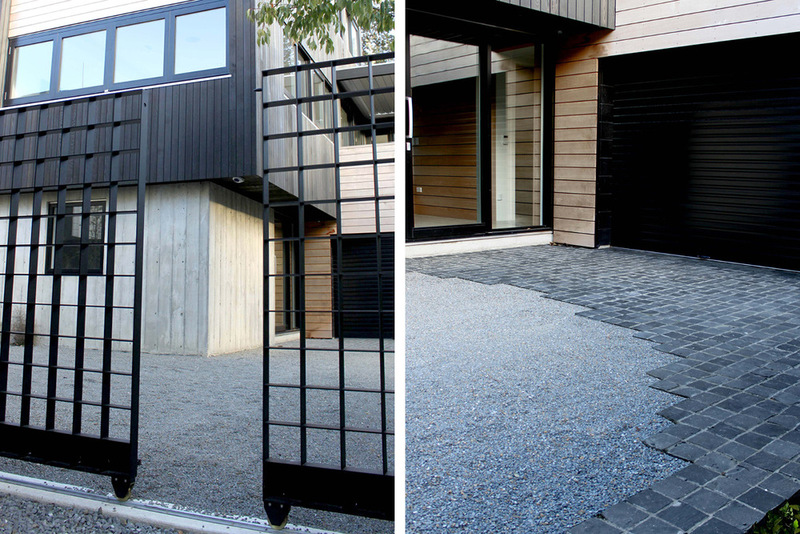 Insitu acid-washed concrete and gravel paving surfaces are alternated to provide each courtyard with a different feel. 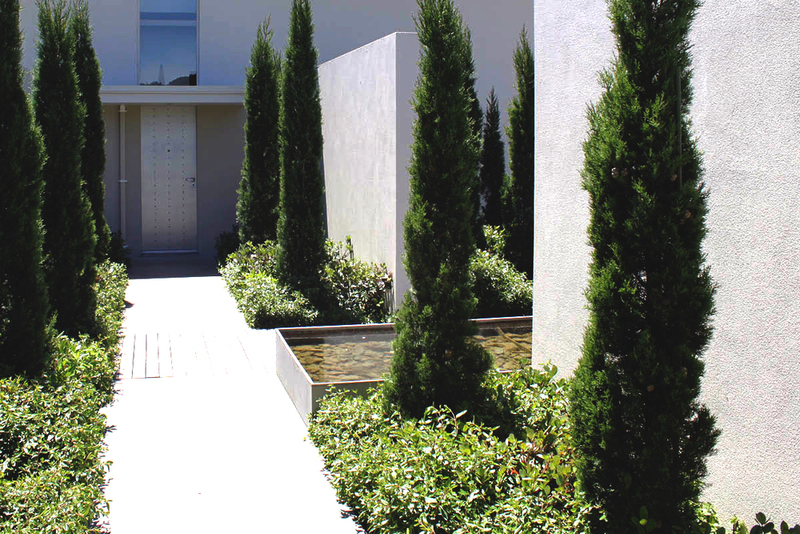 The courtyards are linked by timber “bridges” cutting through the lines of corokia hedging. This multi faceted project provided a site-wide masterplan for the continued development of a hillside property near the head of Pauatahanui Inlet. The existing courtyard built by Wellington Architect Gerald Parsonson was redesigned to overcome persistent drainage and wind issues. New walls were added to separate the entrance path from the main courtyard space while a 10m aluminium pond connects the two spaces through a gap in the walls. Aluminium is also used to make garden bed edges, seat legs and a gate which is inspired by local reed beds of the Pauatahanui inlet. Extensive drainage works were undertaken before a carefully selected palette of wind hardy plants were introduced to provide a simple, robust and evergreen backdrop. Gravel, timber and concrete provide contrasting but humble surfaces. 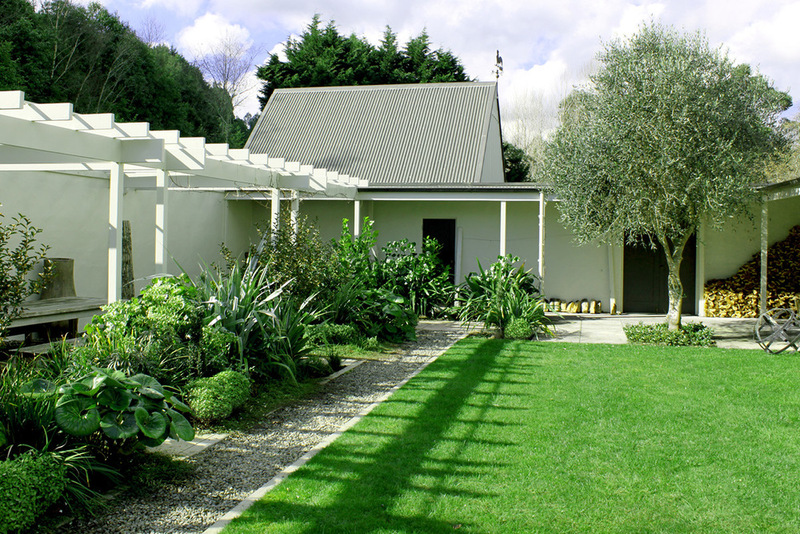 The garden was featured in Home NZ magazine's Feb 2011 issue and the Contemporary Gardens of New Zealand book. 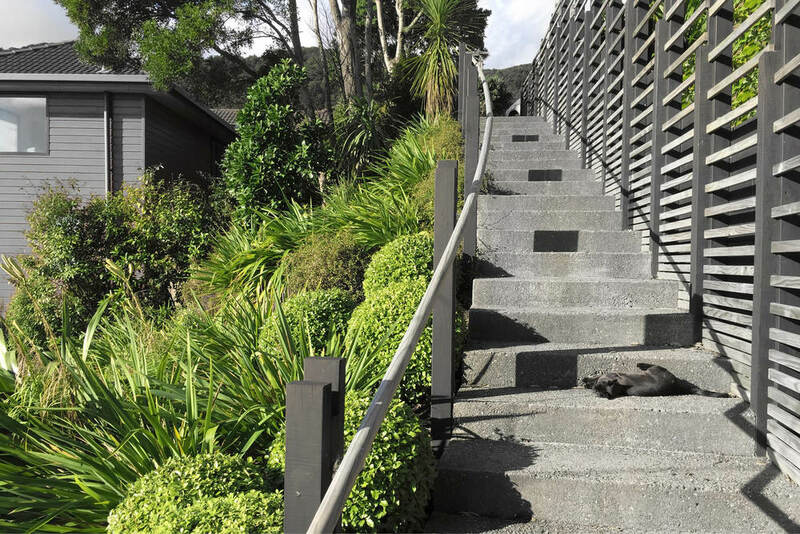 MNLA were commissioned to redevelop the garden around a 1970’s Ian Athfield home on a typically hilly site in the Wellington suburb of Roseneath. The project has been undertake in two stages, the first of which was completed in 2014 and the second is due for completion in 2016. An award winning extension to the house by John Mills was completed in the interim. 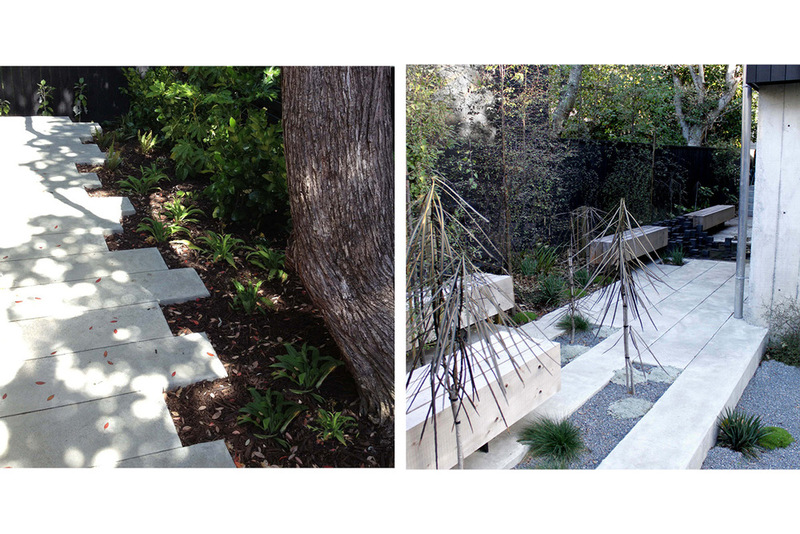 The design focusses on creating subtle interventions which work with the terrain and blend with the gardens forest setting. 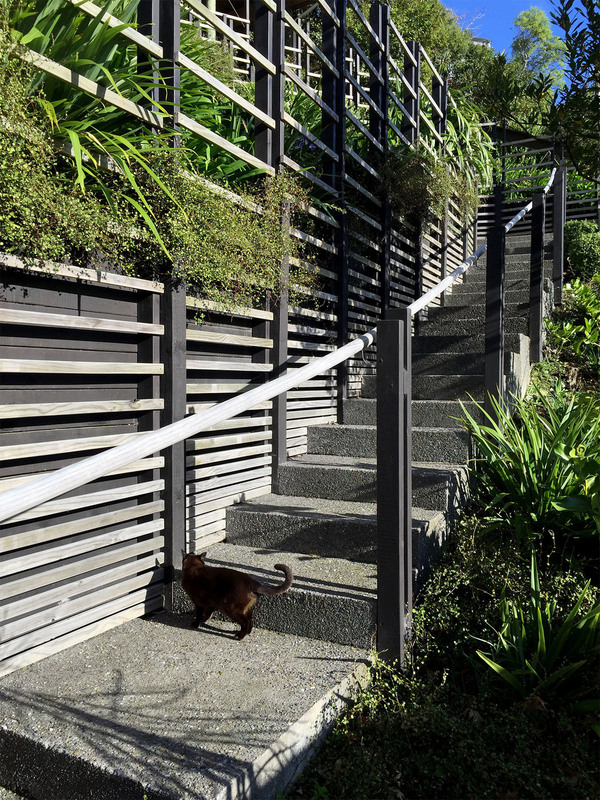 A sinuous set of steps were created to provide pedestrian access to the front door through the forest which was thinned and underplanted with shade tolerant natives. Designed in response to the renovation of an existing three storey dwelling on the site, this harbour side terrace is viewed largely from above. a splash of colour from the bougainvillea climbing over it. 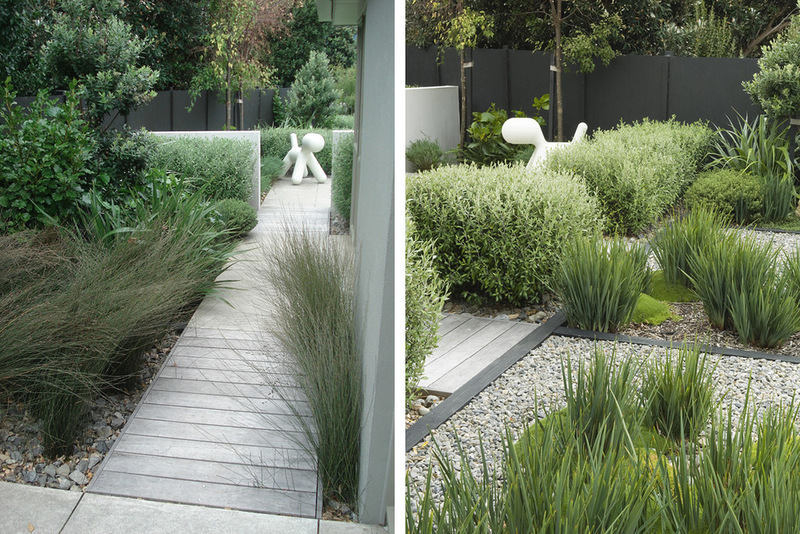 The finished garden received an award for outstanding design from the New Zealand institute of Landscape Architects and was featured twice in Home NZ magazine. 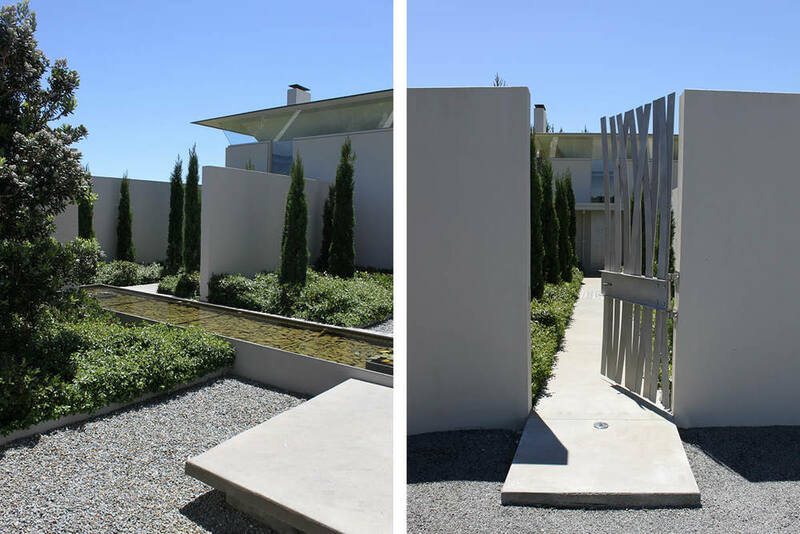 This project aimed to create subtle but effective interventions in an existing landscape around an a diplomatic residence in Khandallah. 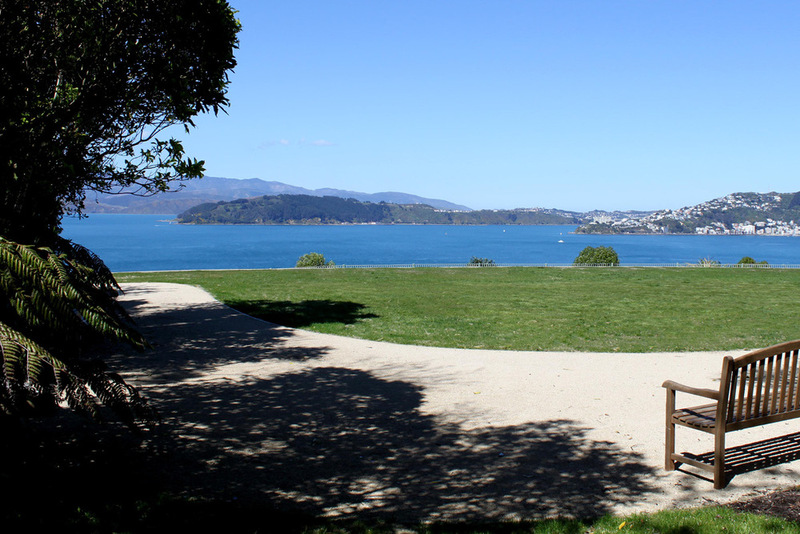 Security fencing was relocated below a new haha and integrated into mass planted flaxes to create an unobstructed view of Wellington Harbour. A new waiting area beside the entry portico was created and mass planted with native grasses to create a minimal yet elegant arrival space. 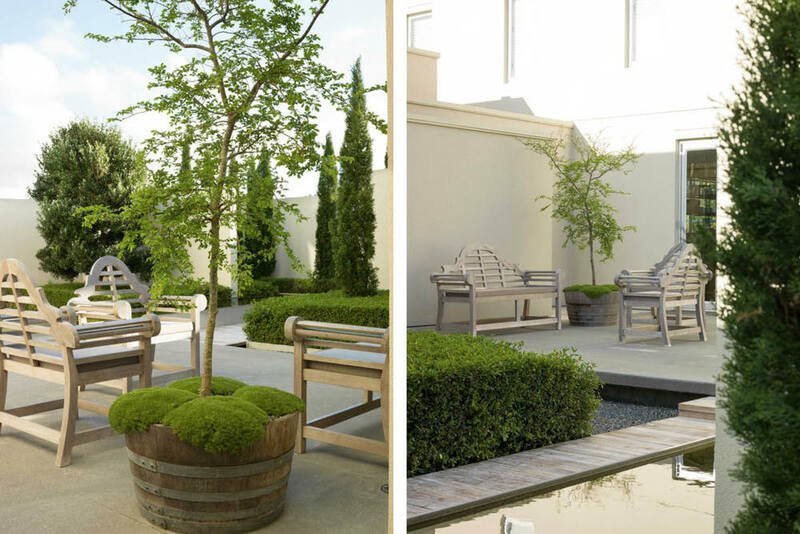 Underscaled terraces were enlarged but softened with planting to create a series of spaces which can accommodate large events without feeling empty for more intimate gatherings. 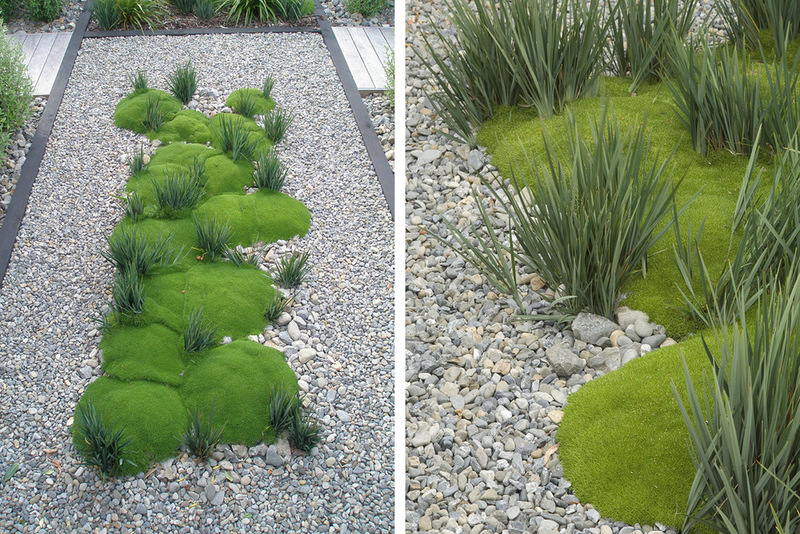 A bound gravel terrace and path was used to extend the paved area while retaining a sense of softness. An orchard, rose garden and vegetable parterre were also created. MNLA were commissioned to design a courtyard within a complex of buildings designed by Architect Gerald Parsonson on a large lifestyle block outside Levin. 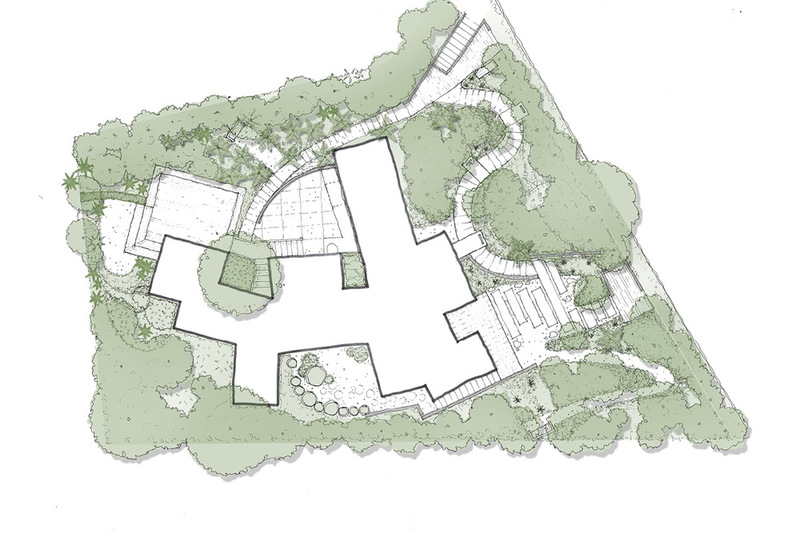 The courtyard provides a central reference point around which the house is arranged and provides the principal view from many of the primary living spaces. Providing interest and structure to these views was therefore a primary concern. The courtyard was divided into several key areas including a shaded outdoor dining area, a large paved surface for entertaining and parties, a small lawn and a band of dense but varied planting to provide interest and seasonality. 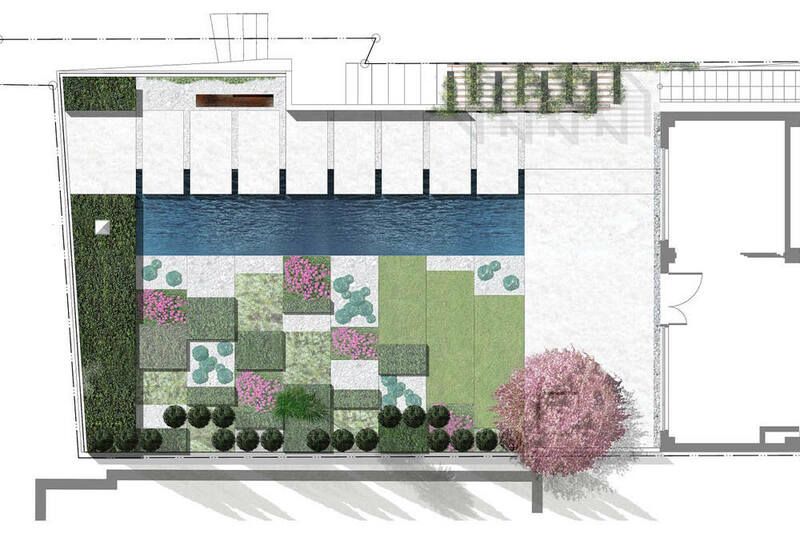 Breaks in the planting aligned with key views and architectural features. . 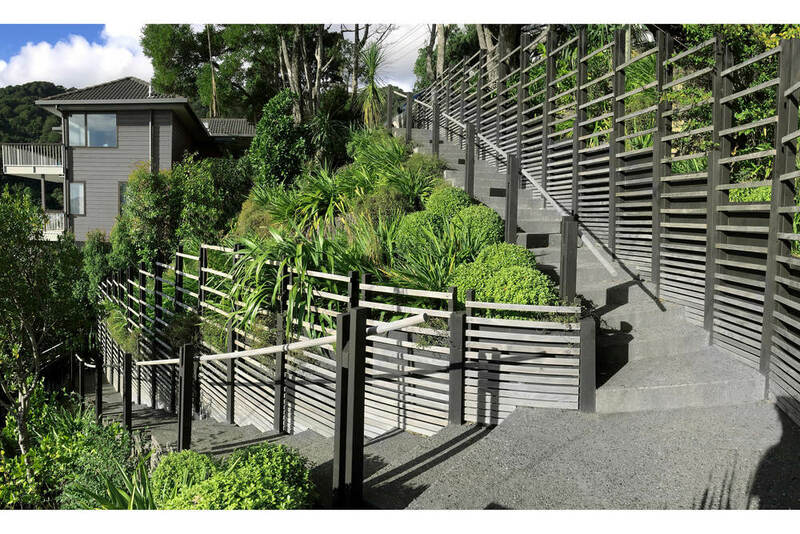 This challenging project is located on an extremely exposed, north facing hill in Karori with extensive, tall retaining and a relatively narrow strip in which to create a garden. 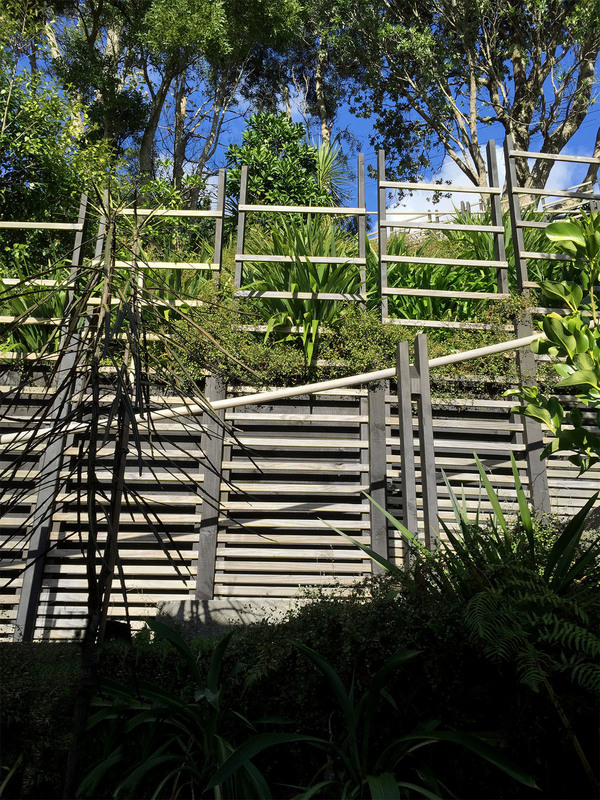 A dynamic, curving timber balustrade was used provide shelter for a corokia hedge, lawn and mass planting of libertia while hardy pohutukawa and ngaio trees were used at either end of the wall to frame the spectacular views to the north. 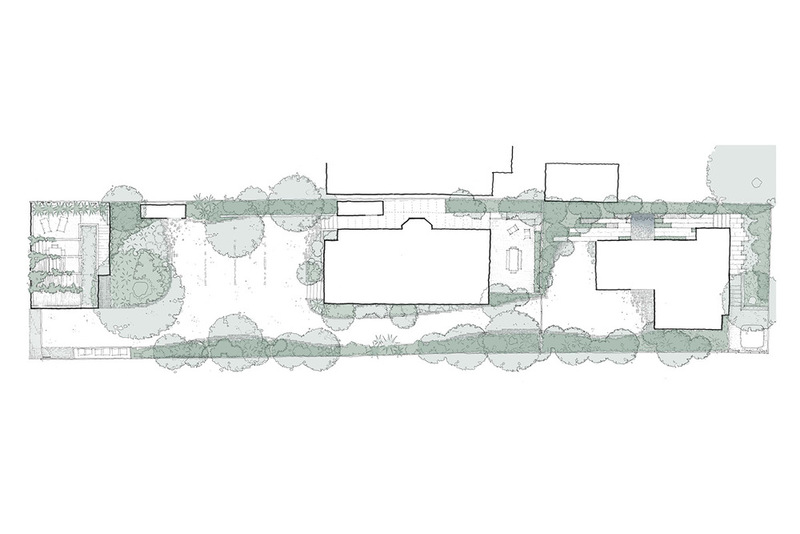 Large concrete slabs of paving surrounded with gravel and lawn were used as to create strong lines and variation as well as providing practical access across the lawn and around the house. 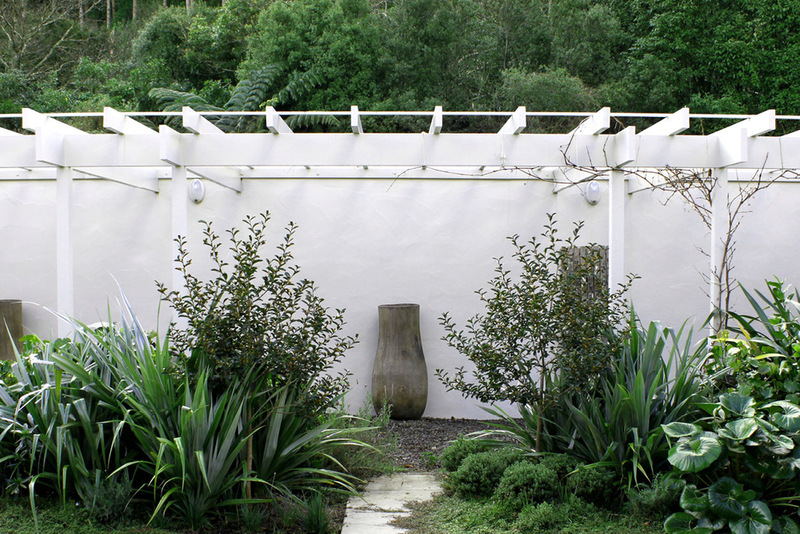 A sculptural washing line was created as the best position for it was in full view of the main entertaining area.